Hair trends come and go, but one of the best recent trends is the macaron hair color. There are so many different things you can do with hair dye, and there is a multitude of ways to create chic, fun looks depending on what you like, but hair stylist and colorist Shelley Gregory has created her own style, which she dubbed “candy unicorn hair.’ The stylist is from Las Vegas, Nevada’s Atelier by Square Salon, and drew her inspiration from the Ladurée macaron and pastry shop, which can be found in Paris. Knowing where Gregory drew her inspiration, you can really see how it played out in the execution process. As long as the look is executed professionally, the variety of colors can enhance your overall look, giving you a truly unique hairstyle. It is a great palette for your favorite looks from any season, since the macaron hair colors would look fabulous against any season’s backdrop. Winter is the most ideal season for this hair, however, since it will look stunning with a snowy backdrop, and against the softer tones you often wear for the season. But it is inexplicably diverse, since it’s not confined to that one time. “It’s kind of like Disneyland, where it’s magic,’ Gregory continued. “I wanted that feeling when you look at this hair.’ And she definitely succeeded in that goal. The macaron hair color trend can bring out the inner-child in any woman. There is something so magical about the way the locks fall into place amid the rainbow created, and it adds an element of mysticism that is sometimes so severely lacking in adulthood. It’s a look little girls will look at in awe, and adult women will be able to appreciate it, if they’re not rocking it themselves. 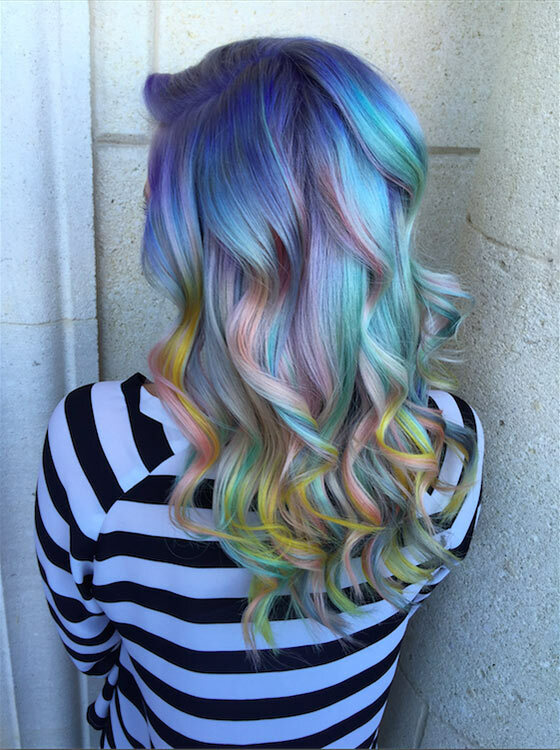 “Candy unicorn hair’ is created by using seven colors: blue, mint green, purple, pink, peach, silver, and yellow. This look was first introduced on Gregory’s Instagram page, and she decided to further disclose her intentions with creating a look like this. “You see rainbow hair but it’s too much,’ she began. “I wanted it to be a toned-down rainbow. And something yummy-looking!’ This explains why she took inspiration in the Paris pastry shop. And we’re so glad she did, because this hairstyle can be stunning. 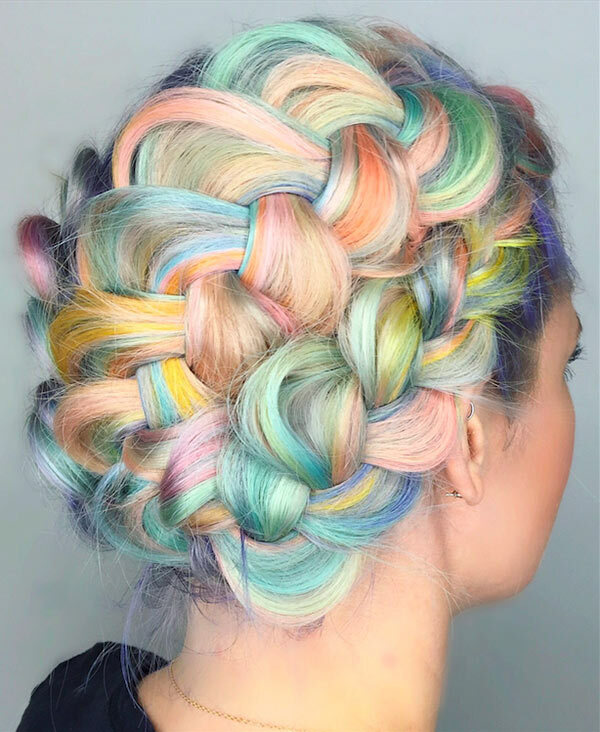 Women have been trying to execute fun, pastel rainbow hairstyles, as Gregory said, but often lack the sense of sophistication that this look can achieve. 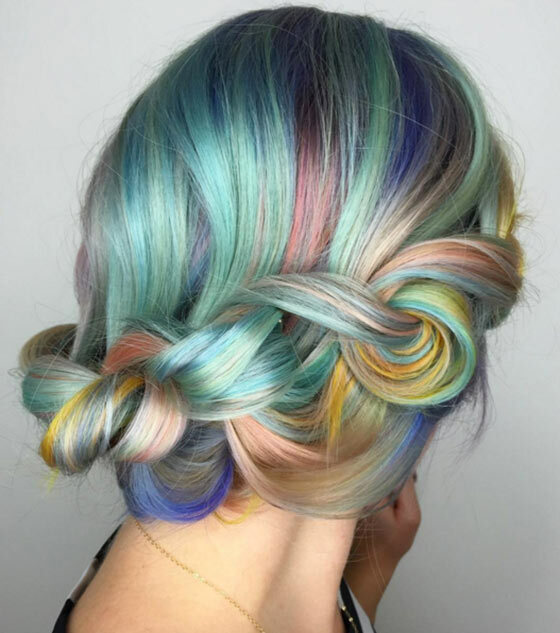 The use of pastel hues tones down the rainbow-effect while still giving a great amount of unique color. 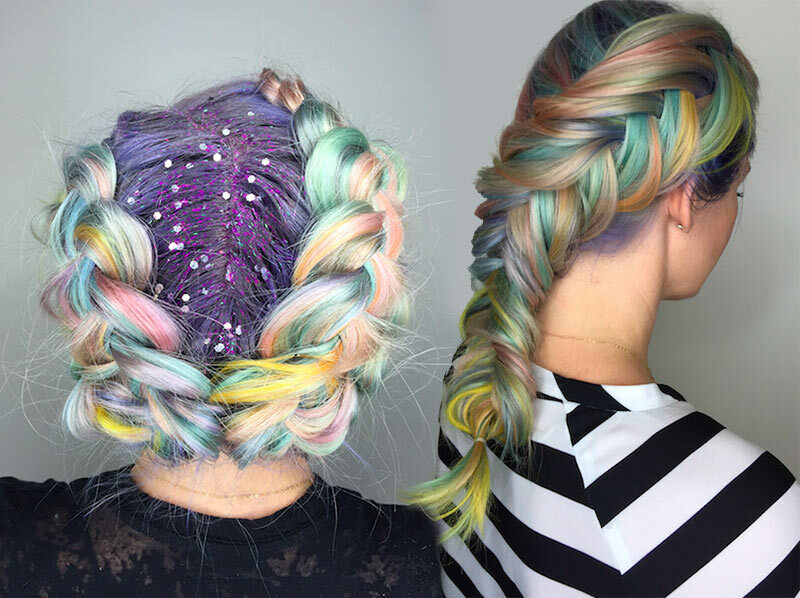 The candy macaron hair trend brings “party hair’ to a whole new level. You may stress over what the perfect hairstyle would be for a holiday party, and this could offer the perfect outlet. It’s fun, it’s colorful, but just enough so. It’s a look you can use to be the star of the party, but also for a simple day out to run errands. Who knew you could have fun and practical all in one hairstyle? But, if you’re looking for an exclusively fun look, Gregory suggests adding glitter to your roots, by mixing glitter with hair gel and using a simple paintbrush or blush brush to apply it directly.